Congratulations on choosing TEMPUR®! You are joining our growing number of owners worldwide who are enjoying the amazing comfort and pressure relieving benefits our products bring. Here are some tips to help you get the best out of your investment with us, and also what to expect as you start to use your TEMPUR® item. No doubt you are already aware that TEMPUR® is a temperature sensitive, visco-elastic material with an open cell structure that moulds to the contours of your body. Through distributing pressure evenly over the entire area of use, TEMPUR® provides optimal comfort by allowing your body to rest in its natural position, eliminating pressure points which can be a source of discomfort. Congratulations on choosing TEMPUR®! You are joining our growing number of owners worldwide who are enjoying the amazing comfort and pressure relieving benefits our products bring. Here are some tips to help you get the best out of your investment with us, and also what to expect as you start to use your TEMPUR® item. No doubt you are already aware that TEMPUR® is a temperature sensitive, visco-elastic material with an open cell structure that moulds to the contours of your body. Through distributing pressure evenly over the entire area of use, TEMPUR® provides optimal comfort by allowing your body to rest in its natural position, eliminating pressure points which can be a source of discomfort. So you know what to expect when your TEMPUR® product first arrives, and to help you look after it in years to come, here's some hints and tips to help you. During shipping, the covers of larger items such as mattresses may move from their original position. Once you have your mattress unpacked and on your bed base, allow some time for the TEMPUR® material to warm up in the ambient air temperature. Then you can simply straighten and smooth the cover back into position by hand. Once they have unpacked their new product, some people notice a slight odour to their new mattress. This is completely harmless and will disappear within 4-6 weeks. Allowing the product to air or 'breathe', preferably uncovered in a well ventilated area before and after use, may speed up this. Following the steps recommended in the ‘break-in period’ section will also help. If your previous mattress or pillow used more traditional methods of support such as springs, feathers and/or fibre, it is likely your TEMPUR® products will initially feel different. Our high level of support sometimes means your body needs to adjust to the change. Just give yourself and your mattress and/or pillow time, and within a few weeks you will be enjoying the amazing comfort, support and pressure-relieving properties that a good night’s sleep brings. The more time you spend on or in bed: reading, watching TV, playing with the kids or even grandkids, the better! The extra movement will help the cells in the TEMPUR® material to fully open (some may have remained closed after manufacture). As they open the cells 'breathe' and respond more rapidly to weight and temperature, but they will always return to their original shape. To the user it may feel like the mattress is getting softer, but in fact there is no change to the pressure relieving properties of your product. It is more likely your body is more ‘in tune’ with your bed. If you share a bed, while it's not essential, occasionally rotating your mattress head to foot may help to maintain even comfort and support for both users. You may find this tip useful especially as everyone's individual body shape is unique. For pillows, during the first 2-3 weeks of ownership, it can help to use them as cushions during the day to improve the support and pressure-relief they are designed to deliver when you are sleeping. If you have chosen a loose filled traditional or rectangular shaped pillow we advise you to 'plump' these items regularly. This will prevent the TEMPUR® particles from sticking together and creating uncomfortable dips in your pillow. Please note TEMPUR® would not recommend using an electric blanket with a TEMPUR® mattress as the mattress works best in response to the natural body heat of the user. You may not experience optimum support if an electric blanket is used, as potentially it could cause irreversible damage to the pressure relieving properties of your mattress. If, however you still wish to have extra warmth, we would suggest an over electric blanket rather an under blanket. Please ensure it is not more than 10 years old and in proper working order. For the same reasons above, TEMPUR® also do not recommend use of a hot water bottle with your mattress. If you still feel the need to use one, should this item develop a leak which wets, stains or damages your mattress we must advise you it will invalidate your manufacturer's guarantee. • TEMPUR® mattresses must be stored flat, ideally in the original packaging. • TEMPUR® toppers may be rolled up or stored flat. Do not unroll a TEMPUR® topper when it is cold as there is a risk of the material tearing or cracking. Allow the topper to come up to room temperature first. • Due to the visco-elasticity of TEMPUR® material, mattresses, overlays and toppers can become slightly compressed during transportation or storage. This is normal and the product will regain its normal size after a short time at room temperature. • TEMPUR® products should be stored in a dry environment (maximum 65% relative humidity). Product care and general maintenance (including cleaning and washing) TEMPUR® mattresses must always be placed on a ventilated bed base e.g. with springs or slats, or a platform topped unit on castors, legs or feet to allow air to circulate freely, preventing moisture from accumulating. Most TEMPUR® items have covers which may be carefully removed for cleaning or just for airing, allowing you to freshen up your product. 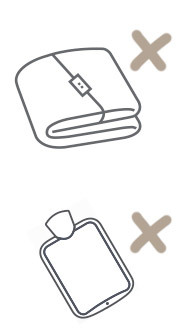 A label stitched inside the cover will give you specific care instructions for the item you have purchased. Detailed care instructions specific to every item listed in our current ranges can also be found in the product description section of the item concerned. If, however, you are a TEMPUR® owner of an older model, we recommend you check the care label instructions carefully. In the case of some mattresses such as the TEMPUR® Celebrity 31, these could have covers which cannot be removed or washed. As a general rule of thumb, if your mattress has TEMPUR® material embedded or quilted into the cover (this applies to the majority of older 'Deluxe' models,) while it may be removed for airing, it is not washable. Any subsequent washing will invalidate your guarantee. The same applies to the TEMPUR® Deluxe Pillow which has a quilted fixed cover meaning it also cannot be washed. The composition of the TEMPUR® material reduces the risk of it catching fire. TEMPUR® products fulfil the flammability standards laid down by the Medical Devices Directive. TEMPUR® products (their foams, fillings and composites) also pass the flammability test of the Furniture and Furnishings (fire) (safety) Regulations 1988. However the material can be ignited by direct contact with a naked flame, so smoking in bed, for example, is strongly discouraged. Many TEMPUR® products are CE marked as medical devices class 1, for prevention or reduce risk of developing pressure ulcers, which means that the properties of the product meet the requirements of directive 93/42/EEC. Please check the washing label to see whether the product you have purchased is CE labelled. All TEMPUR® mattresses are no turn! No heavy lifting is involved because you don't need to flip our mattresses over! Each model is constructed in layers so you sleep on the top side only. Advances in TEMPUR® technology have resulted in keeping maintenance to a minimum. Distinguished by their vibrant coloured zips, all TEMPUR® Elite and Luxe mattresses come complete with a QuickRefresh™ removable top cover enabling you to freshen up your bed whenever you wish. QuickRefresh™ Cover composition: 99% polyester, 1% elastane. Beneath the QuickRefresh™ top you will find a second cover which comprises of an off-white fabric under layer with grey material side panels. Along the bottom edge of your mattress you will find another zip in grey. This enables you remove the complete mattress cover for airing or cleaning. Off-white under layer composition: 97% polyester, 3% elastane. Grey side/end panels - composition 70% polyester, 19% mod acrylic, 10% viscose, 1% elastane. Base - 100% polyester. Follow washing instructions as above. Please note: for some TEMPUR® Hybrid Elite or Luxe mattresses, the second off-white/grey cover may not be washable but dry clean only. We always recommend you check the label stitched inside for care instructions. 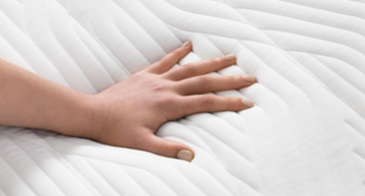 All TEMPUR® Supreme mattresses have zipped removable covers. Below are details of how to care for this range: Cover composition: Top: 99% polyester, 1% elastane. Sides/ends: 98% polyester, 2% elastane. Base: 100% polyester. Upon removal of the mattress cover you may find a thin layer of stocking type material. Do not remove this layer. It is an important part of your mattress. Please do not attempt to wash, sponge or dry clean the mattress itself. Doing so will invalidate your product guarantee. There is a high possibility you will cause irreversible damage, destroying the benefits of comfort and support which the patented TEMPUR® material provides. In the event after removing the cover there are signs of stains or soiling on the mattress surface, you can wipe it over carefully using clean water on a well wrung cloth (free from chemicals and detergents, and no wetter than a baby wipe). This may help to remove or reduce marks. Allow the mattress to air and dry thoroughly before replacing the cover. We recommend the use of a TEMPUR-FIT™ Mattress Protector to keep your bed clean and fresh.